With the tools to achieving authentic Teshuva in mind, I would like to address the counterintuitive placement of Rosh Hashanah and Yom Kippur. Typically, we would hope to undergo the process of Teshuvaby cleansing ourselves thoroughly beforefacing judgment. Why then, does Rosh Hashana, the Day of Judgment, precede Yom Kippur,the day of cleansing? Even more puzzling, the days of Teshuvaare coupled with Yom Kippur. Thematically, both are days of atonement, and practically, both follow the Day of Judgment, in counterintuitive fashion. The answer strengthens our understanding of both the mercy of G-d and the potential of man. When the year comes to an end and all our positive and negative acts are weighed on the scales of heaven, G-d takes a good look at us. This event takes place on Rosh Hashanah. The Ramban explains that Rosh Hashanah is primarily a day of Gevurah (stringency). Our actions are openly scrutinized. It is our job to evaluate ourselves and envision the person we want to be in the coming year. Only after we resolve how we fit into the puzzle of creation and the broader Jewish nation, can we engage in sincere Teshuva and ultimately reach atonement on Yom Kippur. The difficult process of self-examination and complete humility is the only road to Teshuva. On Rosh Hashanah, we evaluate ourselves impartially and honestly, asking for what we need to reach the lofty goals that will bring us closer to G-d. By Yom Kippur, we finally know who we want to be. Only after we have that foresight can we genuinely ask for forgiveness and begin the journey into a better year. The Maharal compares the Yetzer Hara, the evil inclination, to an experienced king who knows his subjects well. On Yom Kippur, G-d wants to free us from this ancient king and be our one and only ruler. To do so, G-d requires us to detach from all physicality during Yom Kippur. Removing our physical needs frees us from the enticing evil inclinations that are present throughout the year. Only after we break free from the shackles of the “ancient king,” do we acquire the clarity to reflect on our true identity. In the Beit HaMikdash, the kohanim would find two identical goats. One would be sacrificed to G-d, and the other would be led up a mountain and pushed off a cliff. The latter goat represents the Jewish nation’s sins and lives longer than its counterpart. In fact, as a mountain goat, the oblivious creature blissfully traipses along until the last moment, when it is suddenly pushed to its death. This powerful metaphor allows us to see the Yetzer Hara objectively. When caught up in the materialism of the physical world, it is easy to feel as if we are untouchable and we become content. However, the aimless roaming leads to nothingness, and the realization that the pleasure was fictitious comes all too late. Yom Kippur allows us to disconnect from the power the Yetzer Hara. Towards the end of the Yom Kippur prayer, we chant the confessions in a joyous melody to celebrate our liberation from sin. Like the person who whistles while he works, happily anticipating the end goal, the Jewish people are performing the necessary “work” to emerge from the Day of Atonement fully redressed, and ready to face the new year with purpose and clarity. May this Yom Kippur deepen your connection to your true essence, give meaning to your year, and may G-d bless you with all the resources necessary to serve Him properly. Noam Beltran is a senior at Yeshiva University, Sy Syms School of Business studying finance. He is simultaneously pursuing an MA in jewish philosophy at Bernard Revel Graduate School of Jewish Studies. Originally from Los Angeles, CA, Noam spent a year at Yeshivat Ohr Yerushalayim in Moshav Beit Meir and a second year at Shapell’s Darche’ Noam in Jerusalem. 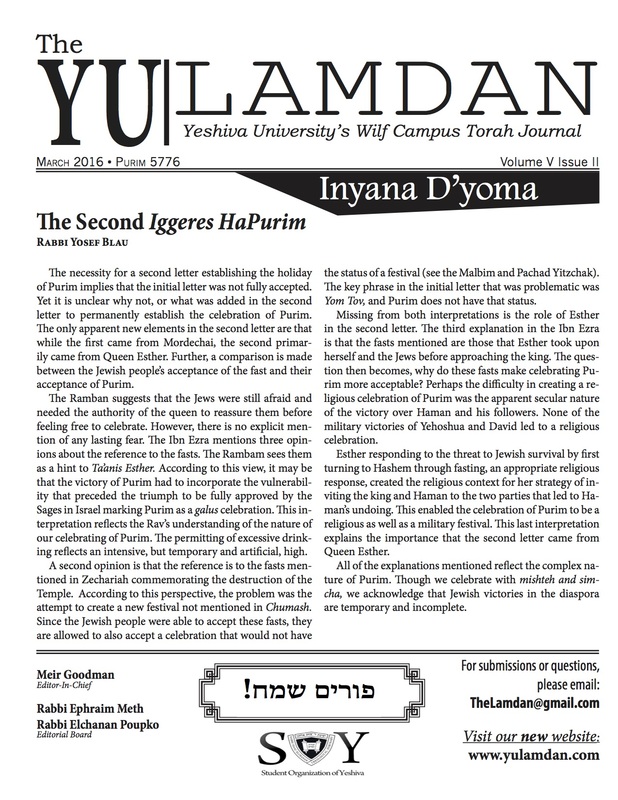 In addition to writing for The Commentator, the official newspaper representing the student body at Yeshiva University, Noam tutors fellow students at the Wilf writing center.